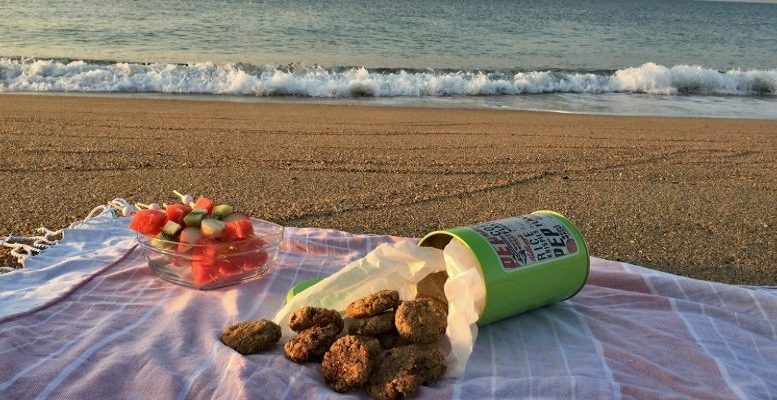 Beach picnic– Live on an island bathed by the Mediterranean, so spend a whole day in summer at the edge of the sea, with family or friends and a lot of junk, is very common. Actually, it is one of the most endearing memories of my childhood: sun, sand, salt water and a meal that tastes like glory after being soaking all morning. That’s why today I’m going to propose 5 recipes for a beach picnic . To succeed in the choice of our beach menu, it is essential that we take into account that we have to choose dishes that can be taken cold and that are not spoiled by the heat. Therefore, if one of the ingredients is, for example, mayonnaise or tomato it is best to take them apart, in a portable refrigerator. And make the mixture just before eating. Better to be foresighted than to have a dislike for intoxication. Ingredients: 1/2 teaspoon mayonnaise sauce, 1/4 teaspoon Dijon mustard, 100 g marinated veal, 1 scoop of fresh mozzarella cheese, 1 avocado, 1 tomato, arugula and 2 slices of whole grain bread or cereal. Preparation: We start with the sauce. For this, in a small bowl, we mix the mayonnaise sauce with the mustard. We stir until we obtain a homogeneous sauce and reserve. We can make more quantity and save it for other elaborations. To taste. Next, we remove the mozzarella ball from the whey it is immersed in and cut four slices. We keep the excess in the serum, inside the refrigerator. Cut the avocado in half, lengthwise, and separate the two halves. We remove the skin from the boneless half and cut four slices. Finally, wash the tomato and cut three or four slices. Once all the ingredients are ready, we assemble the sandwich. We spread the mustard mayonnaise on one of the slices of bread and place layers of the ingredients in the following order: marinated veal, mozzarella cheese, avocado, tomato and, finally, arugula (to avoid softening). Cover with the other slice of bread and ready. 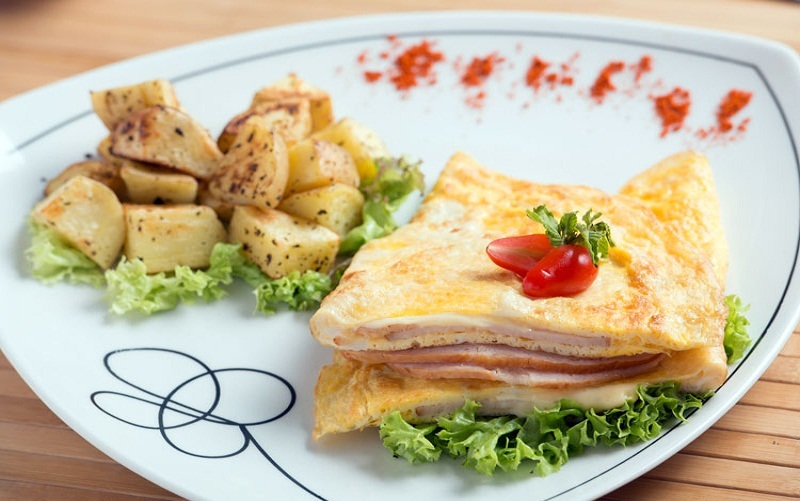 Ingredients: 600 g of minced beef, 3 slices of Bolognese mortadella, 2 eggs, 4 tablespoons of sugar, chopped parsley. Preparation: We start with the candy, which we make by heating a saucepan with the sugar and then distribute it through the bottom of the mold that we are going to use. I used a cake mold of 25 cm. To make the cold cuts, we also need a plastic or kitchen film that will help us to roll up the content. On the film, we distribute the minced meat making sure that we stay with the length of the mold and allowing it to extend through the width of the plastic. Spit over and cover the meat with the three slices of Bologna bologna. 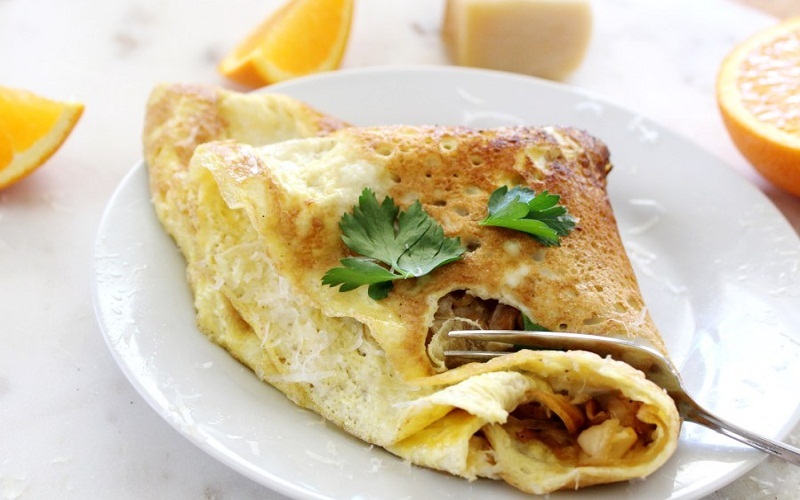 In a large pan we make a French omelet with the two eggs but instead of forming it, we let it be as if it were a crepe to make it thin and wide. We spread the tortilla over the mortadella and with the help of the film we roll up the cold cuts of minced meat forming a cylinder. We put the cylinder in the mold and remove the plastic. 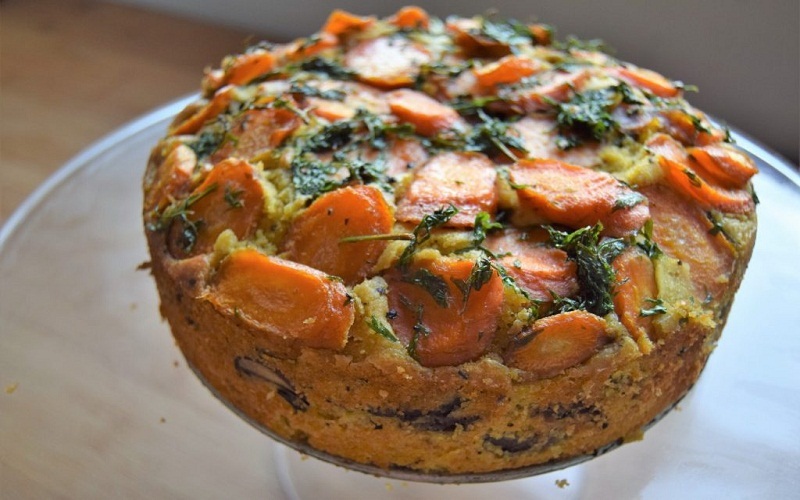 Sprinkle with chopped parsley and cook in a bain-marie in the oven for 35 minutes at 180º. We take out of the oven and cover with aluminum foil, placing a carton of milk on top to cool down pressed. While it is cooling, we collect the liquids from time to time, as they will serve to make a sauce with which to accompany the cold cuts. Once cold, unmold and cut into thick slices. Ingredients: 5 medium onions, 5 large potatoes, 5 eggs L, salt. To accompany: Fried green peppers. Preparation: To make the recipe there are two tasks in reality, on the one hand to comfit or caramelize the onion in its own sugars, on very low heat and without adding sugar or Modena vinegar, soy sauce or any other ingredient. On the other hand, comfit the potatoes when frying at low temperature so that they are really tender. To comfit the onion, we chop in julienne and place over a low heat in a large pan with abundant olive oil. We add a pinch of salt and let it go slowly. During the first minutes we will stir enough so that the onion strands are made equally. When the volume of the onion decreases, we can remove part of the oil leaving the onion to be reduced to a volume similar to that of a tangerine. The process, stirring from time to time lasts about 1 hour and 15 minutes. At that time, we peel the potatoes and cut them into thin slices. As we are also going to confit, we put a pan with a lot of oil and we toss the potatoes in oil before lighting the fire. When you start your fry from cold oil, supertiernas will remain. Then we do them slowly, without the oil cooking at any time. When the potatoes are ready, beat the eggs in a bowl, add the well drained potatoes and add the caramelized onions. Mix the ingredients well and set the tortilla to our liking. We put a pan with a lot of oil and toss the potatoes in the oil before lighting the fire. When you start your fry from cold oil, supertiernas will remain. Then we do them slowly, without the oil cooking at any time. When the potatoes are ready, beat the eggs in a bowl, add the well drained potatoes and add the caramelized onions. Mix the ingredients well and set the tortilla to our liking. We put a pan with a lot of oil and toss the potatoes in the oil before lighting the fire. When you start your fry from cold oil, supertiernas will remain. Then we do them slowly, without the oil cooking at any time. When the potatoes are ready, beat the eggs in a bowl, add the well drained potatoes and add the caramelized onions. Mix the ingredients well and set the tortilla to our liking. Ingredients: 100 g of prawns, 1 head of lettuce, 100 g of surimi sticks, 1 egg XL, 8 green olives without bone, 1 small onion, 100 g of bonito of the north in olive oil, salt, vinegar, oil of extra virgin olive, mayonnaise, 1/2 small carrot. Preparation: Cook the prawns and the egg and let it cool completely. Meanwhile, in a large bowl, chop clean and dry lettuce, surimi sticks, olives, chives and bonito. Peel the boiled egg and cut it often too, as do the prawns. Mix everything. We lightly add a little salt, vinegar and olive oil and a couple of tablespoons of mayonnaise. Pincelamos bread mold with a thin layer of mayonnaise, cover with the filling and roll with care. Decorate with grated mayonnaise and carrot, for example. We keep refrigerated until the moment of serving. 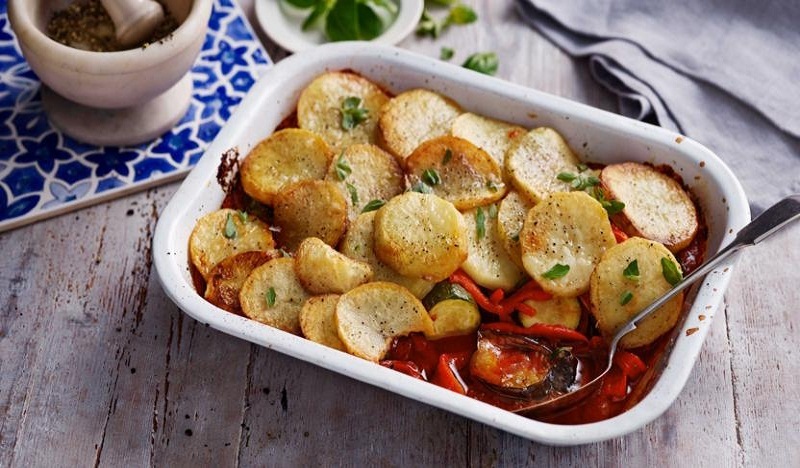 Ingredients: 6 potatoes, 1 kilo of tomatoes, 2 aubergines, half a head of garlic, 1 green pepper, salt and oil. Preparation: We started washing the aubergines, we removed the ends and cut them into slices not too thin, without peeling. We arrange them in a colander with a little salt and let them make the bitter juice. Meanwhile, peel the tomatoes, remove the seeds, chop them and arrange them in a pan to make a thick sauce. We let them simmer. Peel potatoes, wash them and cut them into slices. We heat oil in abundance and fry them with the garlic. As they are fried, we will place them on a tray. We remove some of the oil from frying the potatoes to make the pepper cut into strips. Rinse the eggplant slices in plenty of water, pass them through flour and fry them. We will put them on the potatoes that we have reserved. 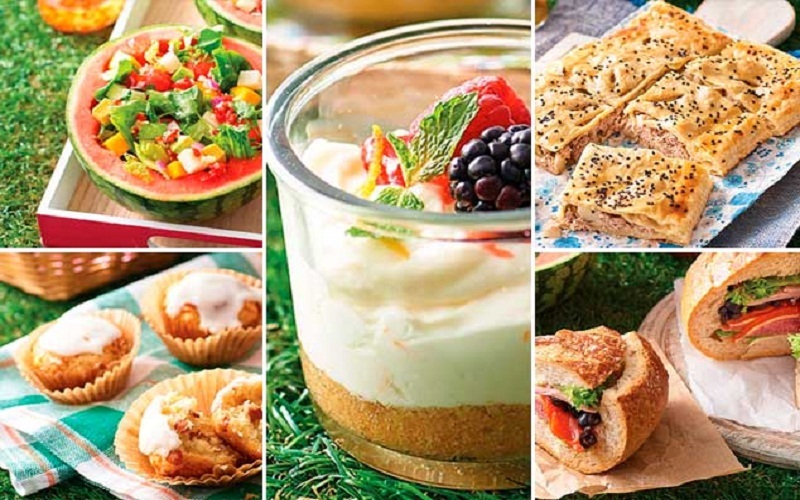 Be the first to comment on "5 best recipes for a beach picnic"